You’ve heard about how lasers work, but what does this mean for science?! We see everyday how light interacts with matter. Ever wonder how a rainbow is formed? Or why your straw looks bent or even broken when it is placed in a cup of water? Both of these phenomena have to do with light interacting with matter. If we use high powered lasers as our source of light we can observe even more awesome effects—yes, cooler than a rainbow. So back to how a straw appears to break in a cup of water. 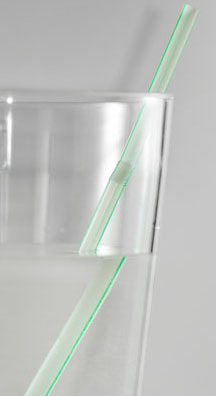 The straw appears “broken” due to a property of light known as refraction. Image adapted from source. If you feel the straw you can easily conclude that the straw itself is not broken. But then why does it look that way? This illusion, called refraction, occurs because light bends dramatically as it travels between materials with different densities, such as air into water, but why? Light actually changes speed as it travels through different materials. Light can travel extremely fast in a vacuum, where there are no obstacles in its way. Molecules in air are spread far apart, and light can zip through without being slowed down too much. However, the molecules in water are more closely packed, slowing light as it makes its way through. Light reflects off the submerged part of the straw, bounces back through the water and emerges into the air on its way to your eyes. At each new material, the light has changed its course slightly as it changes speed. By the time it reaches your eyes, the light is way off course! Compared to half of the straw above water, whose reflected light has traveled only through air, the submerged half appears way out of place. This leaves us to see a broken straw. To describe the speed of light through matter, scientists assign a refractive index to different forms of matter. For example, the refractive index of water is 1.33, meaning that light travels 1.33 times faster in vacuum as it does in water. Under normal conditions these values are constant as light travels through a substance. However, high intensity laser light can actually cause a medium’s refractive index to vary as the light passes through it! And this gives rise to what we call nonlinear optics. Let me show you some examples of what laser light can do and what this nonlinear optics stuff is! This is me with our laser! First let’s remind ourselves how there are different types of light other than visible light: X-rays, ultraviolet light, and many more. The difference between these types of light is their size, or wavelength. Light waves vary in size from very long radio waves the size of a building, to very short gamma-rays smaller than the nucleus of an atom! Different sizes, or wavelengths, also mean different colors of light. Visible light is just a kind of electromagnetic radiation that our eyes can detect. The visibility of this radiation depends on its size, or wavelength. 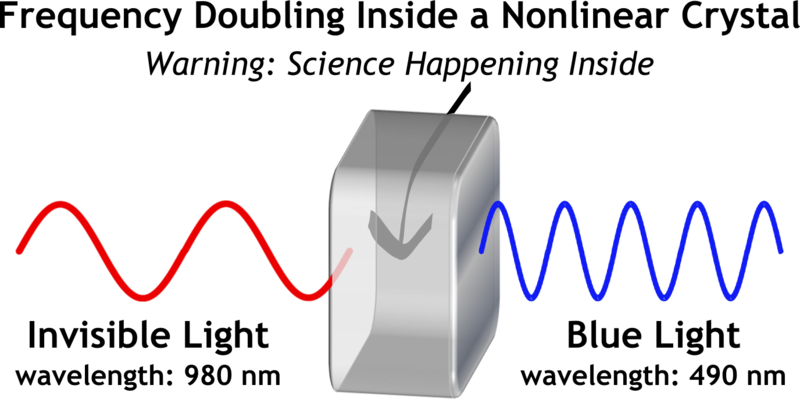 Light waves normally don’t change size as they pass through materials. However, using high intensity light from a laser we can actually create light of a different size, or wavelength, than what we started with! Say we start with laser light that has a long wavelength of 980 nanometers. This light is invisible to our eyes. If we focus this laser light through a special crystal, called a nonlinear crystal, we can actually produce blue light at 490 nanometers! The fancy word for this is second harmonic generation, or frequency doubling. We can turn invisible light into visible light! Crazy, I know! Ever see how white light can be “split apart” and produce a rainbow? Well this illustrates that white light is actually made up of light of all sizes, long and short wavelengths, or all different colors. 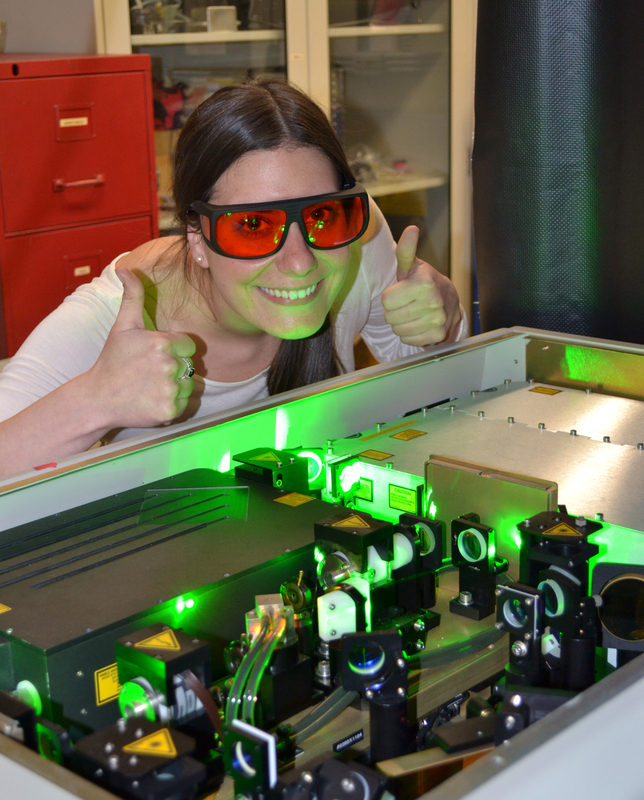 White light can be very useful when using lasers for scientific research. White light enters a prism and is bent and slows. Notice how it speeds up when it exits the prism. This process results in white light being separated into its constituent colors. Luckily for us, we can use lasers to create white light from colored light! Let’s say we take really intense red laser light, which only consists of one size of light, and focus it through sapphire. We can actually generate white light, or light consisting of a bunch of different sizes. So you start with light that has one wavelength and you can create white light, which contains a light of all different wavelengths! All these crazy phenomena are possible because intense laser light can actually change the way a material interacts with light. We do this nonlinear optics stuff every day in the Geiger lab at Northwestern as part of the greater effort of the Center for Sustainable Nanotechnology. So, stay tuned for a post about how we use these phenomena to study how nanoparticles interact with biological systems! there’s something i want to check, but unfortunately no answers pop out from google. Can laser travel through vacuum? if it’s a yes, is it visible? i mean in order for us to see laser, the beam to collide with particles(dust particles etc etc) right? but since vacuum contains no particles…. Awesome question! Laser light, just like any other light, can travel just fine through a vacuum. You are totally right that in order for the laser to be visible it has to collide with particles. So, in a perfect vacuum, unless the laser were pointed directly at your eye, it would be totally invisible.